NBC 5's Ash-har Quraishi has the details on this heart-warming story. For Tony Alfano the greatest reward to his intricate Halloween costume designs is making his 9-year-old son smile. “I’m challenging myself and in the same time making it all about him,” said the father Tony Alfano. Anthony was born premature and his twin brother passed away at just 3 months old. At the age of 2, Anthony was diagnosed with cerebral palsy. “He’s non-verbal but he’s got a smile that makes you laugh,” said Alfano. 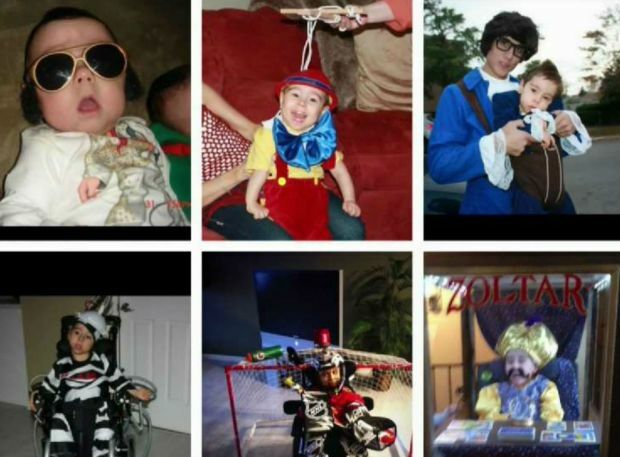 Anthony’s parents have made costumes for him every single year since he was a baby—each year more spectacular than the last. The mother, Deanna Alfano, said everything she and her husband do is for their son. “It’s (the) one time of the year that he really shines,” she said. From Disney’s classic Pinocchio, to a Lincoln Memorial Snow Globe to the iconic fortune teller machine known as Zoltar—this year’s costume is inspired by the 1988 fantasy-horror film Bettlejuice. It also becomes a treat for fellow trick-or-treaters. “He’ll laugh, smile, look around and see the kids and adults coming up to him and giving him so much love and attention that he just eats it up,” Deanna said.